It is always different; the way a White House informs you that you have the President of the United States for an interview. Sometimes it’s a call to warn an important call is coming, and you better agree to the conditions. Often it is four to six people calling to claim credit for making the interview happen. But, as in most things with Obama, this is a drama free process: just an email asking where you can be reached. This email is from Dan Pfeiffer, deputy communications director of the Obama White House, and the cool and collected center of the daily press hub since the beginning of the campaign. Newsweek, along with everyone else, had a request in to the White House to get more of President Obama’s words on the record. The interview is for Jon Meacham, named Newsweek editor at 29, now just 40. Meacham is a poet-historian and, like Obama, a bestselling author. Pfeiffer’s email advises that we will get our interview and it will be on Air Force One. Despite no video or audio, we were pleased and I reply, “We are in.” There was a quick handover to the operations folks for details of the trip to Phoenix for the President’s commencement address at Arizona State University. 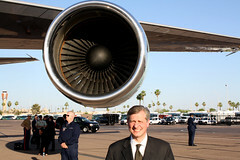 I ask Meacham if he’s ever been on Air Force One, and he said only at the Reagan Library. My only time was during my stint running MSNBC’s 2004 election coverage when 30 Rock was transformed into “Democracy Plaza,” — a piece of an Air Force One plane was part of the plaza-wide exhibition. Meacham and I meet up with Newsweek star photographer Khue Bui, a White House press corps veteran and delightful campaign trail mate, who will round out the Newsweek Air Force One team. 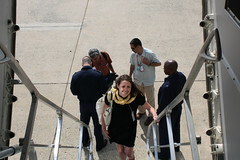 We arrive at Andrews Air Force Base looking like the desk jockeys we are; editors and producers aren’t usually allowed out of their bureaus. We watch as the entire White House traveling press corps arrives for a security check; however, they’ll be traveling on the press charter plane departing ahead of Air Force One. In the classic competitive atmosphere of news media, several casually wander over to ask what we’re doing there. Others are more nonchalant about our presence and the impending trip: one WH press corps veteran practices his golf swing. The press corps is less nonchalant when a group of about 50 military family members arrive to welcome incoming relatives. We know Andrews Air Force Base is a major thoroughfare for military arrivals and departures, but sitting next to soldiers’ kids and parents gives us an intimate peek at their family life. Out on the tarmac, we wait for Marine One’s arrival, the helicopter bringing Obama from the White House. I’ve seen it on TV thousands of times, but it was even more remarkable to watch from the shadow of Air Force One. Obama’s steady walk to “his” plane is interrupted when he sees the gathering of military families. As he turns to approach them, the entire press contingent races to get ahead of him in a TMZ moment to capture the greeting. The families cheer as Obama reaches into the crowd, shaking every hand. This is not perfunctory. You can almost see the energy between the President and the family members as they look into each other’s eyes. 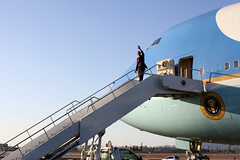 When he turns back toward the plane, there is another mad dash by the reporters and cameras to get in front of him for a good vantage point and camera angle, and then another rush to AF1 for a shot of Obama boarding. 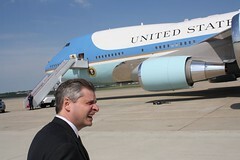 I want to make this clear; Jon Meacham was not part of the press pool scrum, running to and fro on the tarmac. He had a greater share of dignity than most journalists even before he won the Pulitzer Prize. In fact, look at this photo and you can see exactly how he looked during this exercise. We board Air Force One and take our seats in the VIP cabin, located in front of the press cabin. Our seats are marked with special AF1 place cards with our names. 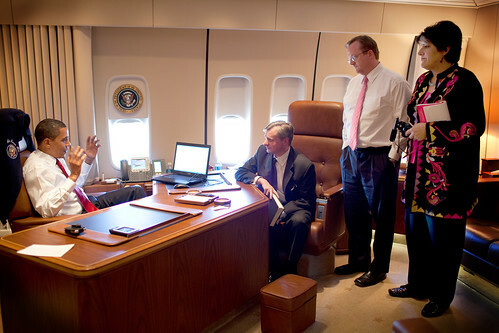 I am embarrassed to ask to have my seat moved, but I cannot sit backwards without getting motion sickness, even on AF1. Lunch is multiple levels above commercial airline fare: fried chicken and, we are assured, homemade strawberry pie. The President can have any food he wants, and the Air Force coordinates with Oval Office operations to find out his likes and dislikes. The Air Force personnel are friendly and generous to a fault. They give us a package for our kids with the now-famous Mount Rushmore photo of Air Force One, as well as AF1 cups, and matches with the White House emblem. The staff apologizes for not having President Obama’s signature on the Presidential Peanut M&M’s box; evidently they’re not in yet. As we relax and wait, Obama’s press advance team member Katie Hogan tells us our interview will be at the end of the flight, so for four hours we get to think about the interview and this remarkable opportunity to fly with the President. An Air Force staffer hears us talking about trying to make a call and offers to place one for me. My husband is in Austria and it was the first time he was happy I woke him up! Our heads swivel whenever someone walks through our cabin, though none care to take a look at us. There are scratch pads that say “Aboard Air Force One,” but who would use one? We slip a pad in our bag, saying they’re for our kids, but we’re not fooling the Air Force One staff or ourselves. The bathroom on AF1 is roomy with a Cadillac-quality leather toilet seat cover as wide as any Sumo wrestler could want. I could have comfortably brought a friend in with me. Toothbrushes, toothpaste and nicely wrapped soaps like those in high-end hotels and spas. We meet the fascinating Ellen Eckert, official White House stenographer, before our interview. She has been traveling on Air Force One, transcribing onboard interviews for all of the last few presidents. She explains she’ll be holding a boom microphone in front of Meacham and Obama, to record both their comments. Check out the transcript here. Newsweek photographer Khue Bui has traveled with Ellen before, including on Air Force One on 9/11. He told us in vivid detail about how President Bush was informed of the attacks and then how they flew from one location to another. That’s Bui’s story, so I will let him tell it, but it added to the sense of purpose for everything and everyone on this plane. We finally get the nod from Robert Gibbs and we head towards the front of the plane; almost bumping right into Sarah Hurwitz, an Obama speechwriter, making her first trip on Air Force One. We turn another corner and are upon President Obama in the “crown” as his office is called. The President greets Meacham and, as he turns towards me, says he heard I had a great party (the White House Correspondents Brunch) the previous weekend. I almost dropped my notebook; Meacham had a big laugh! The President’s personal office is comfy but not overly ornate and has few personal items. In an earlier Oval Office meeting, I couldn’t see any personal items other than photos. (Doesn’t he like tchotchkies?) However, the presidential seal attached to the window shade makes the only statement he really needs; and it perfectly aligned for the cross shot. Bui immediately started shooting … even snapping a photo of a file marked “classified” that the President had shut and handed off as we walked in! Meacham took the chair directly across from the President, who was seated near the window, his Air Force jacket casually slung across the back of his chair. The jacket’s two ornamentations-Obama’s embroidered name on one side and the Air Force emblem on the other-created a perfect “frame” for Obama’s face, completing the commander-in-chief backdrop. I felt pretty sheepish to see that President Obama’s chair was facing backwards — at the center of his U-shaped desk. Gibbs, always ready to spring into action on the campaign trail, was relaxed and smiling, the perfect pairing with the President’s demeanor. Obama was completely comfortable in his surroundings and in his language. Before the interview officially began, Meacham and Obama talked about the President’s comments about the future of journalism at the recent White House Correspondents Dinner. The President lamented that no one has figured out the online business model yet. It’s good to know the President is worried about us too. When Meacham asked Obama to read a passage from his book, Obama smiled the smile of a writer who never gets used to their own hard-wrought prose. We were about 22 minutes into the 30 minutes interview when the President said he was a night owl. He made a perfect Spock hand gesture, saying he loved the new “Star Trek” movie. The interview is intense and fast, and Obama’s rhythm is not broken up by a long bumpy descent into Phoenix. Gibbs and I were forced to clutch the leather-covered bench where we sat for stability, though the President never broke his verbal stride. He asked Ellen, who had been kneeling on a padded stool holding the boom mike, and the photographers to take a seat during the turbulence. I just hoped I wouldn’t get bounced off the bench. There is no dignity in falling in front the President you’re covering! We ended the interview as the plane touched down. Most presidents are only too happy to be finished with an interview and turn to something else, but this president clearly enjoyed talking with Meacham. He was gracious when the interview was over, and even thanked me for bringing Captain Richard Phillips (famously freed from Somali pirates) and his wife, Andrea, for an Oval Office visit. I kept thinking about Valerie Jarrett being in charge of the newly christened public engagement office. President Obama is the Engager-in-Chief … what president thanks you for bring someone in to see him? We hustled off the plane to join the rest of the press pool, which was already set up for the “arrival” shot. The reporters swarmed immediately and asked what we got. (Did they think we would tell?) When Obama descended to the tarmac, he nodded to Meacham, now 50 feet away, as he dove into the crowd of 20 or so regular folks who had come to shake his hand. 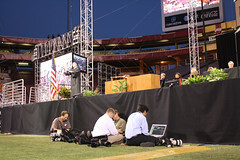 As part of the pool team, I covered Obama’s commencement address at ASU that evening, just inches from the stage in the press buffer zone. 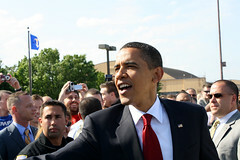 It is always odd to be close enough to a president that you can actually feel what it’s like to be them for a moment. (President George W. Bush once told Arlene Dillon from CBS how strange it was to be president and have people use you as a backdrop for photos of themselves.) President Obama had sit through many speeches, then a long procession of graduating students. Obama wowed the crowd while my press colleagues reported from the press box at the top of the stadium. … and Savannah Guthrie writing her Today Show script in the working press center. Click here for the Newsweek cover story and check out the rest of the photos below.